"S-t-r-e-t-c-h him and he returns to normal size!" The Research and Development meeting was running long on time, and short on ideas. Finally, a nervous fellow stood up and said, "I have an idea for a new super hero. don't imagine hearty back-slaps and congratulatory hair ruffles. 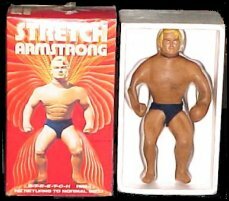 and Stretch to fail to live up to his name. leaks, no skin hardening, good wrestling mat and bandaids (to address small leaks) can bring $75-$150. The hard-to-find Monster can bring much more.